The International Day for the Eradication of Poverty on October 17 offers an opportunity to glance over the magnitude and feminization of poverty in Iran. Iran is a country sitting on a sea of oil. Iran holds the world’s second largest natural gas reserves. Its natural resources are abundant, and the country has access to open sea in the north and south. Yet more than 80 percent of the nation lives below the poverty line, and the middle class has essentially disappeared. 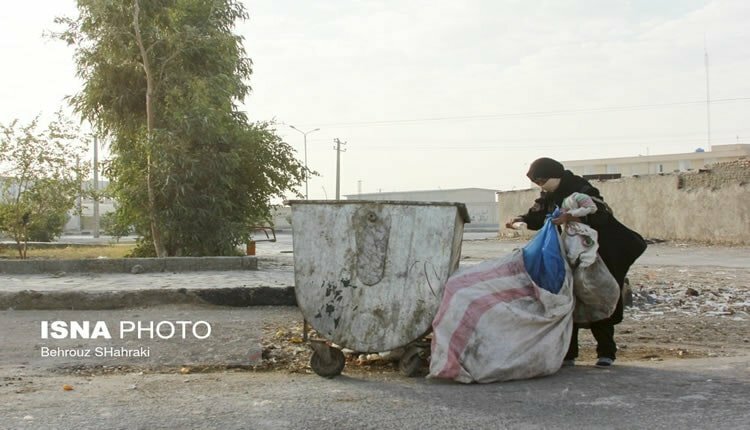 The absolute poverty rate in Iran has risen from 12 percent in 2017 to 50 percent this year, with a poverty line of nearly 6 million toumans (approx. $460), this year. Poverty is growing by the day as the ruling regime’s damaging policies have led to the closure of factories and production units, and the destruction of agriculture, leading to increasing unemployment. At the same time, soaring prices and inflation had already diminished the public’s purchasing power, even before the coutry’s currency suffered a free fall in summer. In such conditions, women suffer from double discrimination institutionalized in the country’s laws and social norms. Facing multiple barriers to employment, women are the most vulnerable social strata. For example, 82 percent of the 3.6 million female heads of household have no decent jobs and live under the poverty line without receiving any government support. The high divorce rate in Iran has also been adding to the number of these women. Thus women constitute the poorest sector of Iranian society so much that the state media and officials have acknowledged “feminization of poverty” in the country. Economic instability is the main cause of growing poverty in Iran. As a consequence, most women are driven to low-pay jobs in the private service sectors, where businesses recruit more women to pay less to their workers. Women have to do difficult work in the service sector. They become physically ill over time due to hard labor while not receiving their meager wages regularly or completely. The unemployment rate for women with higher education presently stands at 23%, while the rate for men is 11%. (The state-run Fars news agency – June 20, 2018) These watered-down figures indicate a male-dominated job market where women who have struggled and overcome various barriers to achieve higher education, do not reap the fruit of their academic credentials. They do not reach their career goals and the financial independent they seek. Women face special obstacles in employment by the private and public sectors where they are easily excluded because of being married or having children. In addition to serious scarcity of job opportunities for women in the public sector, men enjoy priority over women in new employments. Institutionalized discrimination against women’s employment and gender segregation rules at the work place are among the most important reasons for women’s minute participation in the Iranian job market. Government executives and officials often point to gender discrimination and poverty without tackling them. The number of female heads of household is rising due to the soaring divorce rate and plunging marriage rate in Iran. According to the latest statistics, there are 3.6 million women heads of household in Iran, only 200,000 of whom are covered by the National Welfare Organization, receiving a small monthly aid which is less than 10% of the poverty line. More than 80 percent of the women heads of household in Iran are over 50. Along with their children, they become victims of various social damages due to lack of funds. Feminization of poverty has brought about various social ailments for women and children, abandoning and selling their children and even unborn infants, selling their body organs, homelessness and sleeping on the streets, panhandling and sifting through the garbage to find things to eat or sell, just to name a few.